I had an unexpected call from Colin a few hours ago. He’s still sticking easily to his schedule, and at some stage this morning arrived on the outskirts of Vail and decided to nip in for a bite of lunch and a bit of a break from the trail. Things have been quite exciting on the Wee Creatures front since he last rang. A couple of days ago he found himself some 50′ from a black bear. Gulp… He didn’t see it, but he heard it crashing through undergrowth and then turning over rocks in the river/stream/whatevah just down the bank from where he was sitting with the map, at a place called Bear Spring. Um… Turning Over Rocks??? This is just one of many reasons I’ve never attempted to walk in these bear-infested North American places… Anyway… A few minutes later he heard it leaving the water and scrambling up the bank in his direction, so he grabbed his things and made off prettily speedily. 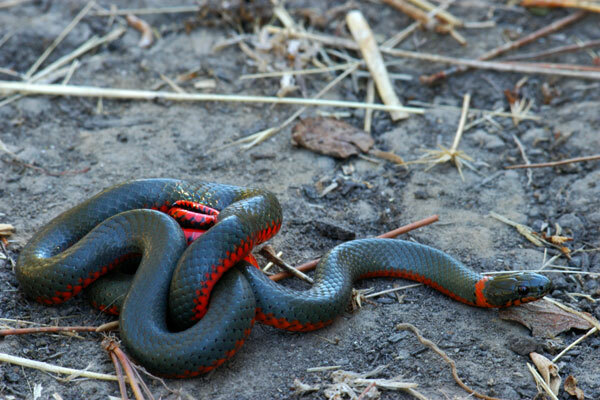 Later on the same day he spotted a beautiful wee snake with a striking red ring around its neck: a little Googling at this end quickly revealed it as the (only faintly venomous) Regal Ringneck snake, and later still he encountered mountain lion pawprints! 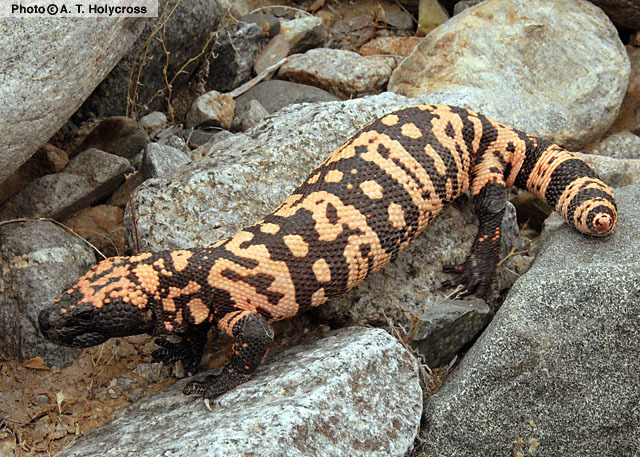 There have been lots of sprinty little lizards, but not yet any more gila monsters. I was sorry to hear that the scorpions haven’t yet made an appearance, but apparently it’s not yet hot enough for them, or for the rattlesnakes. Colin says that temperatures have been a perfect 24 degrees (about 80 in real money, by my quick reckoning), rising to about 28 for a few hours in the middle of the day. Last night the temperature dropped no lower than 10 degrees, so there have been no unpleasant sorties, yet, into either end of the temperature spectrum. Colin’s backpack is doing fine, so far: comfortable and efficient, as well as small and beautifully marked. The tarp was fine too until last night, when unfortunately it was the subject of an attack by some small creature: probably a wee rodent of some kind. Apparently the creature chewed a half inch rip into one corner of the tarp, and nibbled its way almost all the way through a guy line. I’d have suspected Piglet had I not found her lying next to me under the duvet this morning. Anyway, repairs are apparently on the agenda for this evening. Rob Hausam has been sending food to Colin in parcels via Post Offices, and the first batch was collected some days ago in Patagonia. Colin hadn’t tried the Alpineaire food before he set off, but he’s absolutely delighted with it. He said the pasta was so good that he’d have been happy to eat it in a restaurant, and he had a sensational tomato salad for breakfast this morning. Dehydrated tomato salad? For breakfast?? (Sounds disgusting to me…) Colin is the bloke, though, who carried ‘food’ so utterly repellent on the Challenge last year that even he found himself unable to eat it, so I’ll be interested to see how the Alpineaire holds up in the taste stakes as the weeks go by. Colin plans to press on to Colossal Cave Mountain Park later this afternoon, to camp there and to make his way to Hope Camp tomorrow. Tomorrow’s walk will be only 10 miles, but he has to stay at Hope Camp for a night because the following day will take him into the Rincon Mountains Wilderness, and since he’s not allowed to camp there without a permit he’ll have to get through it (about 20 miles) in one day. I wondered how likely he was to be spotted camping illegally in such a remote place, but Colin explained that the Americans take illegal camping very seriously indeed, and that people found to have indulged in it are fined, have their kit confiscated and are made to wear an orange overall. (That last bit wasn’t true. Heh.) Clearly it isn’t worth that sort of risk. Another good reason to stick to Scotland, methinks! The next town on the schedule is Oracle, and hopefully there’ll be another update when Colin gets there. In the meantime, though, it’s goodbye from Colin and goodnight from me! Colin in Arizona — Update! For those who haven’t met him, no: that isn’t Colin. It’s a venomous gila monster. Heh… But he’s seen a few in Arizona and so I thought I’d dig out a picture. As many of you will know, Colin “Super-Lightweight” Ibbotson has temporarily forsaken the icy wilds of Scotland for the balmier climes of Arizona, and has recently embarked upon an attempt to walk the Arizona Trail from the Mexican border to Utah. He hopes to complete the trail over a period of approximately 8 weeks. Colin rang last night via Skype, and told me all about it so far. I’ve already told you about the the gila monsters, and he’s also seen thousands of funnel-web spider burrows (fortunately for Colin, they’re not poisonous to human beings over there), but so far no scorpions. I was also particularly interested to hear about the food available for breakfast in the two hotels he stayed at before he started the walk, but it wasn’t quite as exciting as I’d hoped it might be. There were no grits, but he did get gravy and a biscuit at the first place. He said the biscuit was a bit dry, but until he eats another it won’t be possible to know whether they’re always like that or if he was just unlucky. Roll on the next breakfast buffet, I say! Anyway, Colin seemed more interested in the walking than the food and wee creatures. He’s on schedule, and reached Patagonia the day before yesterday. He’ll be setting off back onto the trail when he gets up this morning (he’s currently 8 hours behind us), and expects next to encounter WiFi in about a week. He’s currently walking through an area where there’s a risk of running into illegal immigrants attempting to cross the border, and various people told him in advance either (i) to worry about meeting them, or (ii) not to worry about them. Confusing. In fact, he had an encounter on his very first night in the mountains! He’d set up his tarp somewhere, and early in the morning he was lying awake when he heard something creeping around outside. Then he saw a shadow creep all the way round the back of the tarp, and a moment later the figure of a man dressed in jeans and a puffer jacket appeared at the front. Colin sat up and spoke, and the man immediately ran away. Colin reckons he was probably looking for the food bag. Apparently almost everybody over there carries guns, and so the bloke was probably afraid that he might be about to be shot. It’s pretty fortunate that he didn’t shoot Colin! Colin and I spoke a bit about the fact that this crossing of the border is a holiday for him, but potentially a matter of life and death for the illegal immigrants. He came across a discarded rucksack a few days ago, and when he took a look he found that it was crammed full of food and drinks. A little later he found a discarded blanket. It seems likely either that one of the border patrols had caught somebody, or that somebody had had to dump all their kit in order to get away at speed. It’s all quite sobering. Anyway, it’s possible that Colin will post over on Andy’s blog at some stage, but his WiFi was a bit dodgy last night and so I told him I’d put an update here. More in due course. Finally, Phil Turner has arranged a brilliant page where it’s possible to track Colin’s progress via Google Earth. It’s here, and, as I type this, the little red blob that represents Colin’s location is currently nestling in Patagonia. You are currently browsing the archives for the Colin in Arizona category.